Veteran’s Day, or Remembrance Day as I understand my friends overseas call this day, is observed today, November 11. In the United States, it is a time to remember the military service of so many men and women. It happens on this day for a reason, of course: World War I, which began 100 years ago this year, ended with an armistice that went into effect at 11 a.m. on 11/11, 1918 (hence, yet one more term by which this special day is known: Armistice Day). On this day, I think of many men in my family who gave years of their life in this service. It is a tradition I suspect many of this blog’s readers share, remembering their own relatives in the military. In my own family my Uncle Ted, my godfather, was an Army Air Corps pilot in World War II (WWII). After being shot down over enemy lines, he spent years as a POW in a German camp known as Stalag Luft I. If you want to read a story of true heroism, check out his. My father served for several years in the Air Force in the Korean War. In fact, every single male member in his family served in the American military at some point. Sports medicine’s attendant issues, as serious as they may be, typically pale in comparison with the injuries the military service-men and -women face. That said, there is significant overlap between the military and sports worlds, and there is a lot we sports medicine clinicians can learn from our colleagues in military health care. Many of the premier figures in American sports medicine–Francis O’Connor, M.D,, for instance–are military officers, who do most of their research on active individuals in the military; so much of that work is directly translatable to athletes. Dr. O’Connor is in fact a past president of this journal’s partner society, the American Medical Society for Sports Medicine (AMSSM). Much of what guides how I treat primary anterior shoulder dislocations in late adolescent and young adult athletes comes from research out of the United States Military Academy. In the pages of CJSM itself, we rather frequently publish studies which have used the military as research subjects. The Incidence of Injury and Physical Performance Adaptations During Military Training is a great example of such a study, published in our May 2003 issue. 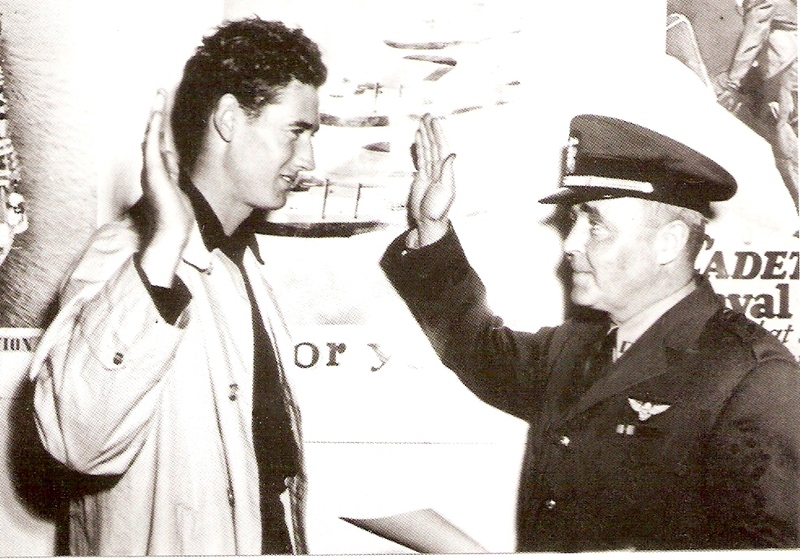 Ted Williams, swearing into the Navy, 1942. And then, of course, there are the multiple well-known examples of athletes who have led parallel lives as soldiers, or sailors or pilots. The great baseball slugger Ted Williams served two tours of duty as a Marine Corps pilot, in WWII and the Korean War. It is arguable that Teddy Ball Game may have had a chance at being the career home run king in Major League Baseball if he had not ‘lost’ nearly five years to the military. And the inspiring story of Louis Zamperini, WWII POW and 1936 Olympian, is told in the movie “Unbroken,” to be released at Christmas. Some of you may have the day off, and I hope it is restful for you. Some of you, including myself, will be working. I hope we all pause to remember the service-men and -women in our lives. I hope, as well, we all pause to consider how we may work for peace in our world. One hundred years ago this year, “The War to end all Wars” began: the promise in that epithet surely has not been fulfilled.